TPF’s Definition File: Bubba’d – A firearm which has been altered/modified from its original configuration, usually in a crude, unprofessional manner. Most common modification for such firearms are to have a cut down, sporterized stock which do not look professional. Mainly used in reference to older military bolt action rifles which no longer are “true to original design”. Canada is home to literally hundreds of thousands of Lee Enfields and other classic military rifles which more often than not have been “Bubba’d”. Most military rifles in the World Wars did not have provisions for mounting any form of optics and those that were had armourers who took select rifles aside and reworked them into being able to accept a scope mount. 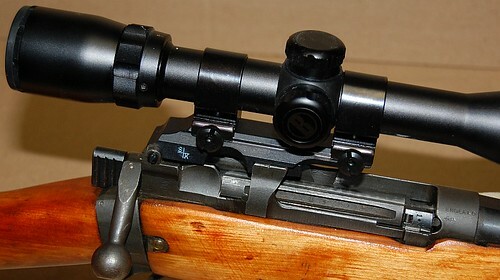 While nearly all modern manufactured rifles have provisions for attaching scope mounts with factory included mounting holes, older rifles, such as the Lee Enfield have no such option. Many of these common Canadian rifles have indeed been “Bubba’d” by the amateur DIY (Do It Yourself) handyman and other than the sporterizing of a stock, the next most common modification is the installation of a drill and tapped aftermarket scope mount. There is a reason why firearms enthusiasts use gunsmiths for much of their customizing work, because a competent gunsmith has the proper tools, patience, and reputation to uphold in order to successfully complete a high-quality permanent alteration. Yes anyone with a hand drill and a set of taps can create and mount a scope mount, but how precise is it? Most gunsmiths have layout tools, dial gauges to ensure proper placement, and various precision machining equipment to ensure high quality work. 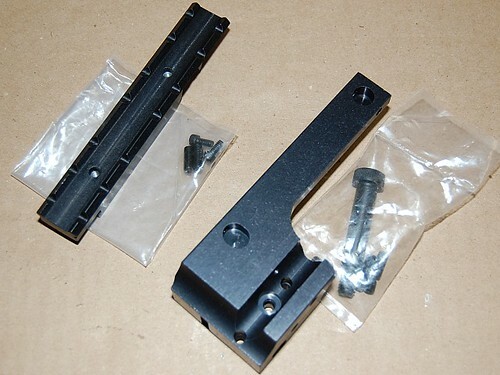 Enter S & K Scope Mounts, a company started in 1964 with a desire to provide mounts for specialty niche firearms market. That niche involved the plentiful, older military rifles and way of attaching and securing scope mounts with minimal efforts and no permanent alterations. S & K have an enormous listing of former military firearms which are able to have an “Insta-Mount” installed, be it a to mount optics in a standard mounting position (beside/over bolt) or a scout mount position (forward of bolt/on barrel). All available mounts are custom manufactured for each specific model of rifle and are generally available with an integrated weaver rail or provisions for S&K’s proprietary scope rings which will be metioned later in this write-up. Installation methods are usually straight forward with the removal of original iron sight hardware, and replaced with a drop in, machined scope mount which is tensioned into secure position. This means that there if the user of an S&K Insta-Mount were to keep all the original parts, he could return the firearm into it’s original form without leaving tapped holes and such which would destroy the historic accuracy of the firearm. TPF was , the able to acquire several different versions of these scope mounts for some of the rifles owned by members of the Canadian firearms community. For this installment of TPF, we install the Weaver style Insta-Mount for a Lee Enfield Mark 4, No 1 Rifle. S&K does not use castings or extrusions or lesser materials for their products, instead they opt to minimize costs by using inexpensive packaging. Quoting S&K, “After all, do you want a nice package or do you want the best scope mount available?” Within the simple packaging of the scope mount was a serious looking piece of steel that was machined very nicely, all required mounting hardware, and a simple but thorough page of instructions. The mount, three screws and a wedge nut. It was time to begin. As per instructions the original rear sight was removed and the two small slotted screws were used to install the mount in the existing receiver holes. This is were a small snag occurred. On installation of the angled nut and the retaining screw, it was found that once installed, the bolt could not be installed due to interference between the bolt head and the bottom of the angled nut. The angled nut was removed, the bolt installed, and then the angled nut was re-installed to complete the installation of the S&K scope mount for the Lee Enfield. 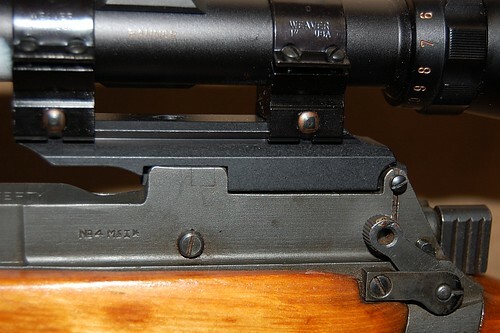 TPF tested the functionality of the bolt and found zero binding issues so the conclusion was that it will not effect usage of the rifle at all, but if bolt removal is desired, the S&K Enfield mount needs to have the wedge nut removed to do so. Maybe it was just a quirk or build up of tolerances in the specific rifle or a slight variation between a Mk 4 & Mk 5 Enfield, but for most people who use Enfields for hunting or other occasional shooting endeavours, it will be installed for years if not decades before even considering removal for any reason. Two pivot screws and a torqued wedge. Ready for rings in under 15 minutes..
With the slight glitch, it was less than 15 minutes from the receiver without the rear sight to having the S&K scope mount fully installed and torqued into position. After which the entire package was completed via a set of weaver rings topped off with a typical Bushnell scope was put into position. Total time elapsed was under 30 minutes using nothing but a flat screwdriver and an allen key. The S&K scope mount appears very secure, rigidly mounted and very robust in design. This specific mount featured a weaver pattern ring mounting system which is very widely used. Another option available is a proprietary style of scope ring mounts which were the start of the company. These “SKulptured Bases” as well as corresponding “Smooth and Kontoured Rings” are machined entirely from a blank of steel and because S&K claims that these are the world’s strongest scope mounts; they are guaranteed for life (beyond deliberate destruction). The final product. Scoped and ready. How much are gun-smithing fees to have your rifle drilled and tapped and the cost of a set of scope mounts? Are there even scope mounts available for your old military rifle? This is where S&K shines as they are dedicated for quality, simplicity and drill and tap free designs. 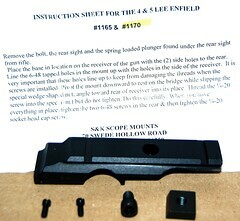 S&K’s Insta-Mount for the Lee Enfield Mk 4 & Mk5, as reviewed by TPF, is available directly from S&K at an MSRP of $65.00 USD. As always it is up to the readers to determine if S&K Insta-Mounts for ex-military rifles are Tactical, Practical or Fantastical! Addendum: TPF will be reviewing more S&K scope mounts in the future, with some other common ex-military rifles available in Canada as well as utilizing their S&K proprietary rings. Mauser K98 scout scope mount (left), and an M1 Garand, offset scope mount. This entry was posted on June 25, 2011 by M. Duynhoven. It was filed under Firearms accessories and was tagged with S&K, Scope Mount.